MixChecker is a great concept, developed to put as few operational hurdles in the way of the time-strapped engineer as possible, and fulfilling its remit as a 'quick check' system well enough. Not cheap. Some flexibility issues. 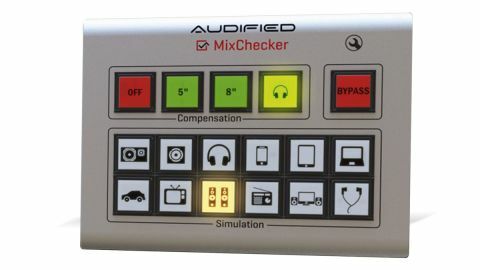 Built on convolution technology, MixChecker solves a problem every producer faces when mixing these days: catering to the range of devices their music will be played back on. The execution couldn't be simpler: place the MixChecker plugin on your DAW's master output and choose one of 12 device Simulations (Classic Studio Monitor, Classic Cube Monitor, On-Ear Headphones, Smart Phone, Tablet, Laptop Speakers, Car Audio, TV, Micro HiFi, Radio, Desktop Speakers and In-Ear Headphones) to have your speakers emulate that device's playback system. If your actual speakers are of low quality, their dodgy frequency response can be corrected for using one of three optional Compensation types: 5", 8" and Headphones. By switching between the various Simulations and tweaking the mix to take each one's individual failings into account, the idea is that you eventually find a sweet spot that comes across as well as possible on all of them. There are no adjustable parameters at all, so each Simulation is generic - ie, you can only select 'Smart Phone', not 'iPhone' or 'Samsung Galaxy S7', and, more importantly, Classic Studio Monitor, not 'Yamaha NS10' or 'Event Opal'. While we appreciate the goal is to keep things as straightforward as possible and give an overview, rather than the exact sounds of a zillion gadgets, this lack of specificity renders the more wildly variable Simulations - particularly Studio Monitors, Car Audio and TV - a little functionally shallow. Also, the Compensation options could do with expanding (especially Headphones, which is almost comically vague), and a Mono button would be helpful. Oh, and the In-Ear Headphones Simulation just sounds flat-out terrible - we don't know what earbuds Audified used in the modelling, but something seems amiss.